Oil Free Otago Hosts the must-see film about climate justice and grassroots movements! 2 Degrees reveals the chaotic failure of the UN negotiations in Copenhagen revealing that we cannot wait for governments to lead the way. 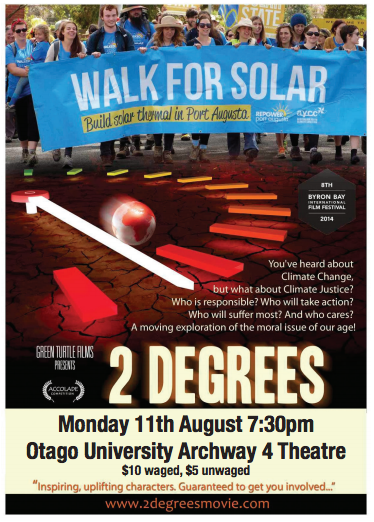 The film documents activists as they take to the streets of Port Augusta, a small Australian town, as they campaign to replace the coal fired power stations with solar thermal power. A must-see film about climate justice and grassroots movements in Australia!